The word “lidlboj” is a phonetic transcription in dutch of the english “little boy”. The name itself already evokes the features of the band, which seems to travel through the unknown with the curiosity and freshness proper to children. And this, despite the richness of the bagage of its members, who come from very intense and diverging horizons. The enchanting atmospheric sounds of “lidlboj” build on the expressivity of its musicians, alternating different musical genres including jazz, electro, pop and rock to create a unique universe of their own. The release of their first record “Trees are always right” (november 2009 on the French label BEE JAZZ) has been received with enthousiam and acclaimed by awards such as Choc (Jazzman/Jazzmagazine), Disque élu (Citizen Jazz), So Jazz (So Jazz), Disque d’Or 2009 (Crisscross-jazz) and Recommend CD (All about jazz). Jazzman/Jazzmagazine (Choc) – [Lidlboj]’s pieces divert […] the factual and temporal dimension of the musical art into a role of contamination of a principally formal beauty.One should forget his listening habits in order to consider these installations as objects to admire. 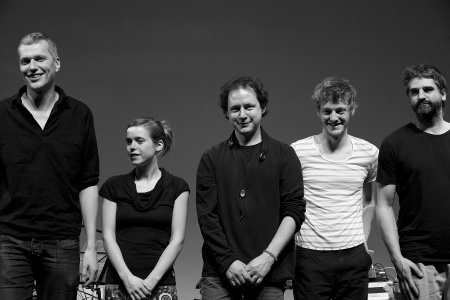 So Jazz Magazine (So Jazz award) – What do Magic Malik Orchestra, Print & Friends, Octurn and Benzine have in common? Jozef Dumoulin integrated within the group. In each of these, the piano player with the build of a basketball player has imposed his paw of luxury sideman, a subtle mixture between emotion and experimentation.Such as a free sketchbook, “Trees are always right” offers an outstanding playground, a (re)creation space without ending and a group (Lidlboj) in total expansion. Crisscrossjazz (Disque d’Or 2009) – Piano player as inventive as Leonardo da Vinci […], Jozef Dumoulin is the kind of alchemist who would transform lead into gold. “Trees are always right” [is a] masterpiece of inventiveness and DIY, it wreaks havoc in everthing on its way. Citizen jazz (Disque Elu) – By turns touching, lively, simple and then complex, natural or highly synthetic, this plural music is yet integrated in an absolutely consistant unison thanks to the leader’s architectural science and a beautiful editing work. However, the reviewer alloted to inform the future purchasers of the disk, has difficulties in choosing the appropriated label for this music which navigates from jazz, pop to electro. M-la-music – There’s no hit in “Trees are always right” : one should listen it from Ato Z, seep into its meanderings, acclimate to the jungle. Franpi – The very name of Jozef Dumoulin in an album indicates a particular sound, a work in depth on atmospheres […].“Trees are always right” is a disk that travels through different universes to create a consistent and delightful music. It probes the dreamlike universe of childhood througout a very atmospheric music which is at the same time an outstanding rythmic work.